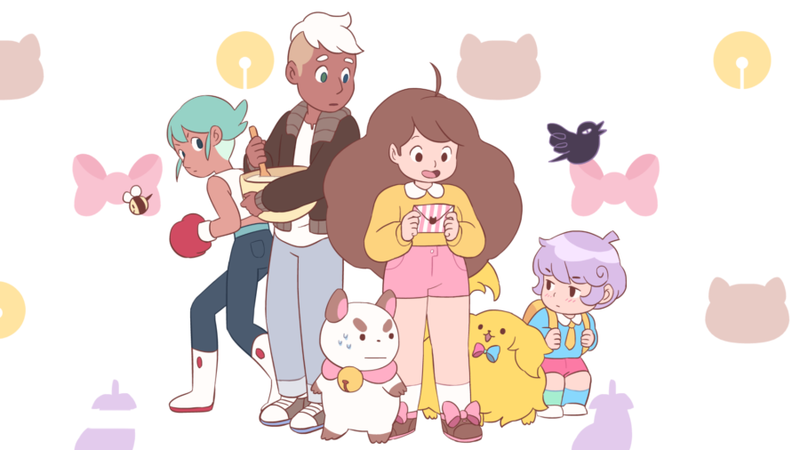 The episodes of Bee and Puppycat trickled out between the end of the kickstarter in late 2014 and the season finale at the end of 2016. I had decided to wait for a full season to watch before seeing if the show lived up to the promise of its pilot, but 2017 was a kind of busy year and I guess it just wasn’t a priority, so I only just got around to watching the short, uneven 10-episode season. While a lot of what was promised for the show was developed a teeny tiny amount in the last episode – in unexpected ways – I’m a little disappointed by Bee and Puppycat. Though Adventure Time staffer Natasha Allegri is still the driving force here, a lot of the spark of the original is gone, and in story, character and visual terms it just isn’t as fun as the pilot promised it would be. Plus I’m a little disappointed that instead of Puppycat being the one with the surprisingly dark past and hidden power (as hinted at in his song from the pilot), that role has instead fallen to Bee, who I felt was much more interesting as an everywoman figure. Some of the new additions to the series are great. I absolutely love Cardamon, the little tot who’s taken it on himself to become the landlord since his mother is no longer capable, and whose final scene is the saddest and most emotionally believable in these ten episodes. The idea of a Pretty Patrick cooking show is fun, especially that Puppycat loves it and ‘Pretty Patrick’ is the only English he speaks. I really enjoyed the weirdness of some of the worlds our main duo visit, especially when they’re morally ambivalent, and many of these new characters – especially Cardamon and Moully – have the most wonderfully natural vocal performances. Especially since Cardamon’s voice actor is a child. Other characters fall pretty flat, like the oh so random wrestling club member. While there’s still plenty of time for more to happen, I was a little disappointed by the direction the main characters went. Puppycat could still certainly become much more interesting in future seasons, but we had no hints of him perhaps having a dark past and saving the day with mouth lasers. Instead he remains just a grumpy, cute sort of a mascot character and there’s more of an emphasis on him being put into embarrassing situations. I’d like a balance between him being a silly pudgy cat-thing and being a hidden badass. They also did far less weird things with Oliver this time, so he mostly sounds like he’s just speaking an alien tongue rather than making lots of bizarre inhuman sounds. Deckard, while a nice character and very well-acted, didn’t really get to do anything much. His dilemma over staying around to be with Bee and to go off to chase his dream is drawn out a bit too much, even over the course of such a short season. I want him to hurry up and talk it through with the others to reach a sensible decision. And then there’s Bee. Not only did the animation style of the show get a lot more generic and Steven Universe-y, with Bee in particular looking very different from the pilot both in appearance and dress sense, she got markedly less interesting even as hints at a very strange past culminated in a big cliffhanger. She’s still a very strong character, natural and flawed while still very likeable, but as the series progresses she seems less empathetic to others, less rebellious and less pro-active. I want to see more of the everyday side of Bee, more of her trying to fit into the world rather than solving problems with interdimensional temp jobs. The show still has a lot of potential and I’m keen to see more if it really does get made. But I feel like an opportunity for something really great was missed here.